As an instructor, you can view what is happening in groups by viewing each user group. You can view student activity within the group and view group-created content. You can also access student groups to create group collaborations and add other group-specific content if necessary. Next to the group name, click the Options menu . Then click the Visit Group Homepage link . As the instructor, you can view all of the student activity within the group by clicking any link in the Group Navigation Menu . You can also participate in any content area in the group, such as creating a collaboration for the group or viewing a group discussion. However, you can still create collaborations and group discussions from the course. Group members can also create their own content for the group. 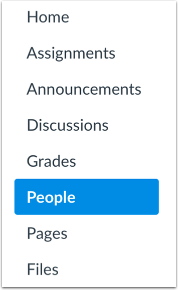 When viewing a student group, you can easily switch and view all groups within a group set by clicking the Switch Group link . Also, instructors and student group leaders can view the Edit Group link , which allows quick access to edit the name of the group. To return to the course home page, view the breadcrumbs link and click the name of the course . Previous Topic:How do I move a student into a different group? Next Topic:How do I use the Modules Index Page? Table of Contents > Groups > How do I view content and student activity within a group as an instructor? Re: How do I set-up a mediation? Re: How can I get students to choose topics without overlapping TOO much?